Avocado roses are all the rage right now. 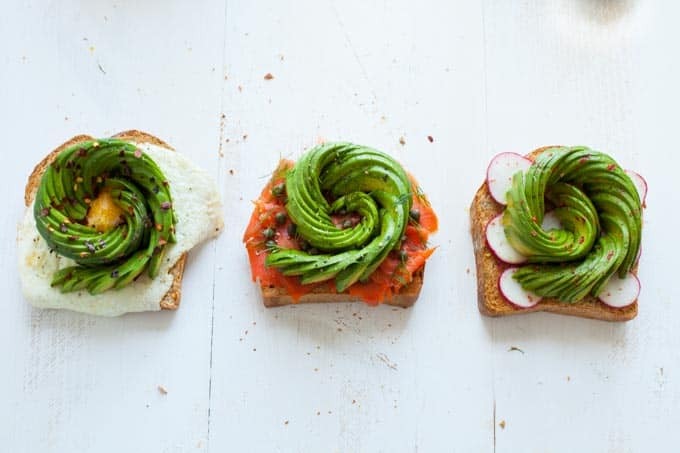 Take your avo toast to the next level with my 3 variations on avocado rose toast. Hey guys! I’m back from my trip to Switzerland – it was absolutely incredible. Its beauty totally exceeded my expectations. I’ve got a few travel posts coming over the next few weeks to talk more about the trip but for now, a recipe! This month’s Recipe Redux theme is “Get your fruits and veggies in shape – show us how you’re serving the bounty of gardens and orchards in shapes like ribbons, noodles, cut-outs, or other creative cuts.” Now I don’t have a spiralizer (hoping to get one on my registry!) so veggie noodles were out of the picture. 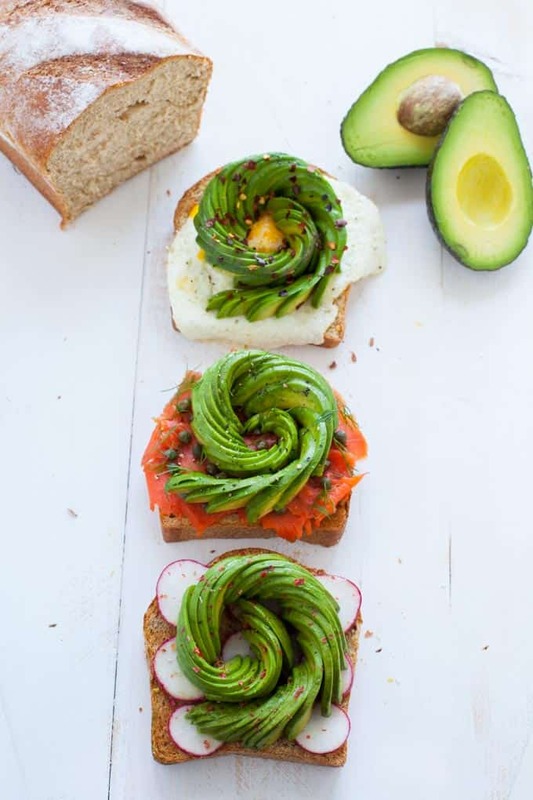 But then it hit me…the latest food photo trend…avocado roses! I’m sure you’ve seen them taking over your Insta feed. I wanted to test it out for myself to see what all the hype is about. They’re super fun to make and I loved shooting them but to be totally honest, if it’s just me and no one else is watching, I’ll stick to smashed avocado toast to save time :). 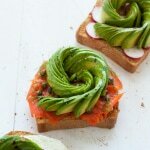 These avocado rose toast variations are delicious. Each has a unique flavor profile and the creamy avocado brings each one together. One of these would make a great snack or breakfast. I ate the smoked salmon and radish toast for lunch yesterday :). Avocados are a great source of healthy fat and over 20 different vitamins and minerals so get avocado rose’ing already. For a tutorial on how to make avocado roses, check out Healthy Nibbles and Bits video. 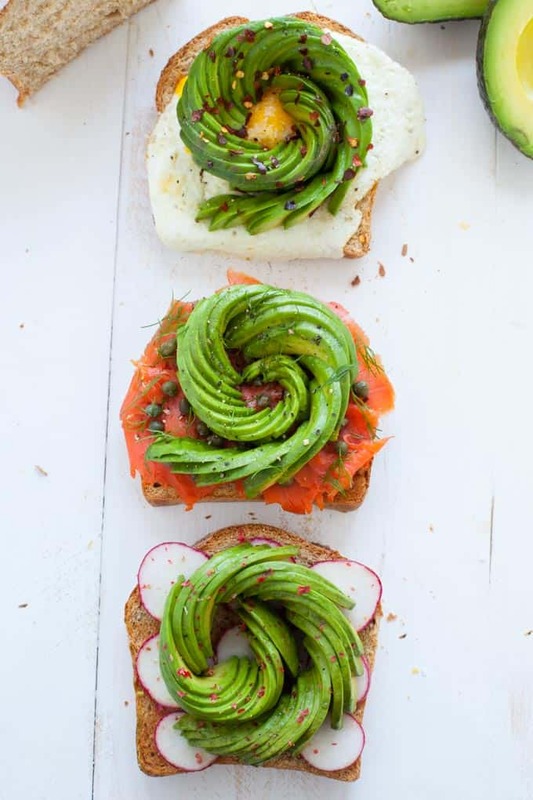 Assemble the avocado roses and other ingredients on a slice of toast. 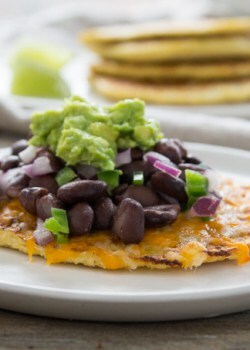 Be sure to squeeze lemon juice on the avocados to prevent browning. I used olive oil on my surface, knife and spatula to keep the avocado roses from sticking. Tell me, have you tried making avocado roses yet? What about avocado toast? So pretty and fun! Would be gorgeous on a brunch table or if you have people over for breakfast. I’m with you though…if I’m on my own and no one is looking, I just smash it onto the toast too. My goodness, these are almost, almost too pretty to eat! (I love avocado too much to ever let it go, haha.) I want all of these in my life right now! First of all, what a great looking recipe! 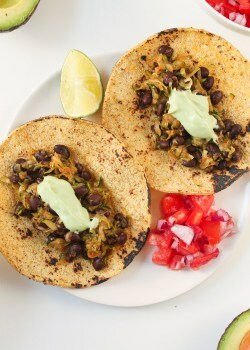 Secondly, they look delicious. Thanks for sharing how to make these avocado roses! 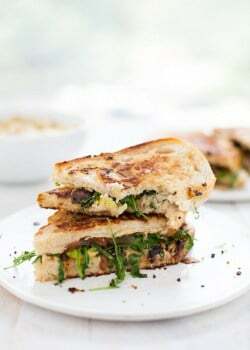 So pretty– and such yummy ideas here! I have been seeing these all over IG and wonders how in the world they make them. Thanks for sharing! Totally going to try it out. You’re welcome, Laura! Have fun! I haven’t tried making a rose with my avocado yet but think it’s worth a shot! Looking forward to hearing more about your travels to Switzerland! These are absolutely GORGEOUS. I am way too lazy for avocado roses, ha! I’ve been wondering for awhile how the heck you make these – so cool! Love your avo toppings, too. Those are so beautiful! I think the fried egg might be my favorite…love a good runny egg and avocado! Thanks! I couldn’t agree with you more. Runny yolks make my life. I first tried my hand at avocado roses after seeing Lisa’s video a few months ago. All 3 look amazing but that one with the fried egg is totally calling my name! Gosh , those are just the prettiest little things! Definitely perfect for a shower or party! Love this! I will take one of each. 🙂 Absolutely gorgeous photos! I need to buy some avocados JUST to make these roses. So pretty! Haha good plan :). I love that Switzerland holds such a special place in your heart, EA! So special. It is such a beautiful country. These are gorgeous! I’ve been meaning to try making avocado roses. Thanks, Jeanette! They’re fun to make!